Automatic juicer for citrus: Oranges, lemons, mandarins, grapefruit and pomegranates. The machine uses a squeezing system that is unique in the world, cutting the fruit in half and squeezing it without the juice coming into contact with the peel, this means the juice does not pick up any of the oil or bitterness in the peel, so what you get is top quality, 100% pure, natural tasting juice. The Fresh'n Squeeze CJ- Counter Juicer can be seen throughout manhattans finest juice bars including health care facilities, health food stores and markets. This machine is recognized globally for producing the sweetest juice with the lowest levels of citrus peel oil within the juice. This machine is perfect for Juice Bars, Hotels, Bagel Stores and Dinners. This piece of equipment is perfect for large Dinners and supermarkets that are looking for a quality, industrial juicer. The Multi Fruit Juicer is capable of juicing oranges, grapefruit, lemons and limes and provides the maximum yield from the fruit. The durable transparent reservoir on the front of the machine is ideal for mass-bottling. Made of stainless steal and NSF approved plastic parts, this machine is easily dismantled for cleaning with no tools. The original Automatic Juicer can still be purchased orange juice machine. These machines have been on the market for over twenty years and make a great center piece around any juice bar or dinner. Perfect for new juice bars and lower traffic stores, the Sunkist Juicer will give your customers a taste that will keep them coming back for. Simple to use, minimal counter space required and clean up make this juicer a great piece of equipment. Oscillating strainer separtes the juice from the pulp so you get more juice from each piece of fruit. All removable parts can be easily cleaned. The Ceado SL 98 has a stainless steel splash guard. Parts in contact with fruits are completely removable and easy to clean. The SL 98 has an exclusive activating micro switch system behind the motor housing, whick means the motor will never accidentally start with an open cover and the micros switch will never get stuck by liquids that may drip along the motor shaft. Dimensions 9' by 7.9" by13.8 H Net gross weight 22 lbs. 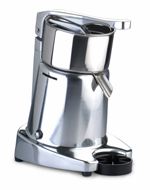 The Ceado S 98 offers a stainless steel bowl, a splash cover, and a powerful and long lasting 250 W asynchronous motor. 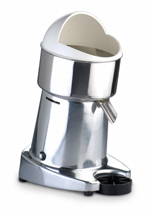 Features Double interchangeable reamer for all types of citrus fruits. Removable stainless steel container. CE and NSF listed . Net gross weight 18 lbs.